Quests Unlimited - Now available on the Steam Store! TIGSource Forums Community DevLogs Quests Unlimited - Now available on the Steam Store! Re: Quests Unlimited - Now available on itch! Welcome back everybody! Another week has passed which means more progress to announce! This week has gone largely as I expected based on last week's update. But there are still a few things to go over. First off, charisma actually does something now!I know, a stat that actually serves some function, how novel. Previous to this change, items were sold and bought at a set price. 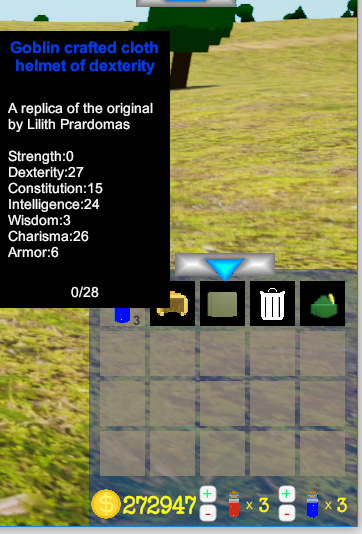 Now how much an item costs and how much you can get for selling it are affected by the party's charisma modifier. There will most certainly need a lot of balancing to keep this balanced and useful but I'm happy it's finally made it's way into the game. The next change is the health awarded for each point of constitution which has nearly been doubled. This is done in an effort to increase the longevity and "epicness" of fights. This also allows for more interaction with the party during fights by utilizing their abilities and popping potions and such. There's also been some balancing of the party's ability to auto cast their skills. There will now be a delay before they can use those abilities whenever starting a new fight. This is an effort to reward actively playing the game while still allowing the game to autoplay adequately. As I posted last week, a lot of this week was spent meeting all the criteria for publishing this game on steam. That took up more time than I'd like to admit but I'm happy to say that all the requirements for submitting my game have been met and now it's only a matter of time. I know steam is the platform of choice for a great many people so I'm excited about introducing my game to a large new group of players. That pretty much sums up the progress made this week. There's nothing new visually to showoff so I'll spare all your bandwidth by not posting something you've all seen already. This week I'm hoping to get some semblance of a tutorial system in place to help introduce players to what options are available to them in game. When I get that working as I'd like I'll upload the new builds to itch.io as well as steam. Until next week, happy questing everyone! Whats up Everybody? I'm back again to keep everyone up to date about progress (or lack thereof) made this week.For reasons that will remain nameless, I had to create a new trailer this week. I just love redoing work I was actually pretty happy with! Anyway, let's get started with the update! First things first, there's a new trailer! I may as well get that out of the way since I mentioned it already. I spent a considerable chunk of time putting together a trailer to replace the one I'd previously made. That's a lot of time invested gathering footage and splicing it all together into something at least somewhat coherent. At least I had a song that I already liked! This one turned out to largely just be a copy of my original trailer but with some key differences to make certain people happy. With that out of the way, I'm also happy to say that there's now an in game tutorial! The tutorial explains how to take advantage of some important features that I fear many didn't even know about. So do yourself a favor and complete the tutorial to ensure that you're getting the most out of the game. 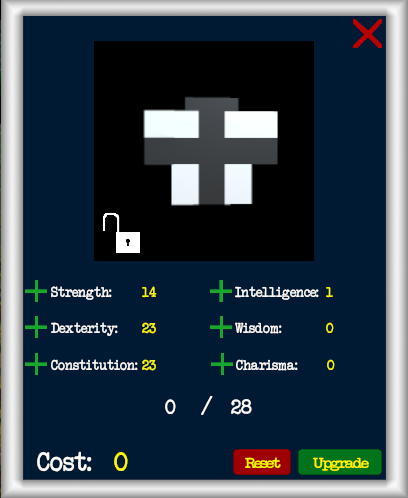 In case nobody noticed, the latest build is actually available now at https://oxrock.itch.io/quests-unlimited. This build introduces not only the tutorial but the advances made in last week's post that I never made live. So if you haven't yet, I suggest you update the game via the itch.io app. Alternatively you can just redownload the whole thing (it's only like 250MB at most). Assuming all goes well, this will be the last build update until the game is available through steam early access. Then of course updates will continue as normal. That about wraps it up for this week. Have any questions, comments or praise(lawl, yeah right)? Feel free to leave it below and I'll b sure to read it. Until next week, happy questing! Hello everyone. I hope you all had a great week. I'm back again with update information on Quests Unlimited. This week has largely been devoted to fixes and creating new art for the game. Let's just get right into it. As for fixes done this week, we'll start with the charisma system. Recently I finally implemented charisma's effect on the party (increasing your sales prices, reducing the price to buy items) but I didn't have any caps in place. In other words, your party could earn 1000% bonus to your sale price with a ton of charisma or it could earn 0% (in other words you get nothing). So I put some limits in place to ensure that parties will at least get 50% sale price even at 0 charisma and it now maxes out at 200% buy/sale bonus with having a lot of charisma. I also tackled a bug introduced in a recent build that made it so that the 3d healthbars couldn't be disabled. After searching a while I was able to determine that it was simply a byproduct of some commented out code that happened due to testing something else. Suffice it to say, this has now been fixed. We also now have a loading screen when entering the tutorial. It can be a bit jarring to have your game freeze for a few seconds while a game loads so I thought it was pretty important to update the loading screen functionality to include the tutorial as well. Hopefully you can at least tell that he's a wolf. As I said, he's a work in progress but hopefully we'll have him in game by next weekend. And with that, I bid you all a farewell for now. As always I'll be back again next week with news of any changes. I hope you all have a wonderful week and make it back to join me next time. Until then, happy questing! Re: Quests Unlimited - Now available on itch.io and "coming soon" to Steam! Happy Saturday everyone! 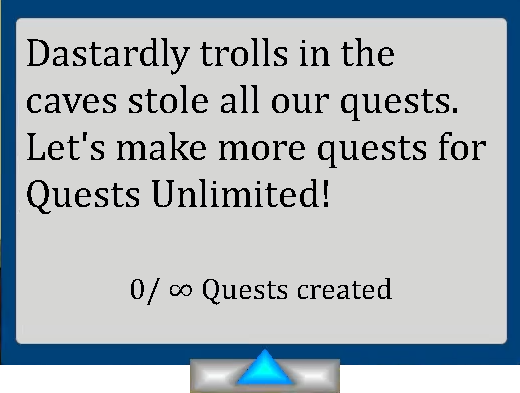 I'm back to bring everyone up to date on the latest Progress in Quests Unlimited. This update should be short and sweet so let's get right to it. 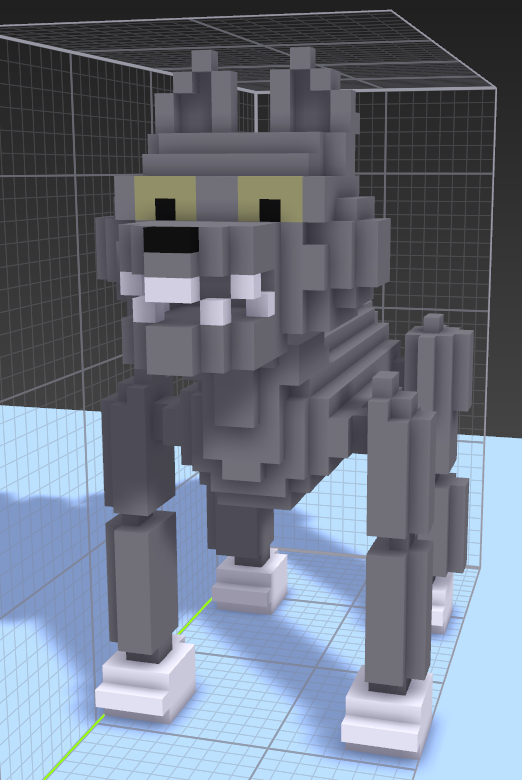 Remember that wolf I was working on last week? Well now he officially has animation and is in the game. Wolves spawn as part of a pack of 4-7 and don't stick to normal questing zones like other mobs. Wolf packs like to attack unsuspecting parties at campfires! That's right, no longer will your party always be safe while recuperating from battles. There's some rules and limitation in place for these wolves you'd all do well to learn about. Firstly, wolf packs don't start spawning until your party's average level is 15. Second, wolf packs spawn on a variable timer between 5-15 minutes. Third, the campfire they'll be waiting for you at isn't necessarily the campfire that your party is utilizing at the moment. Fourth, wolf packs can and will fight anything they come across. That means if another wolf pack spawns in their area, they're gonna fight each other leaving only a partial victorious wolf pack for you to fight. The Steam release is inching ever closer, February 13th is just 3 days away! 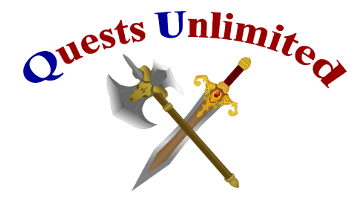 Be sure to keep an eye out for Quests Unlimited and maybe give it a nice review if you enjoy it. That about wraps it up for this week's updates. 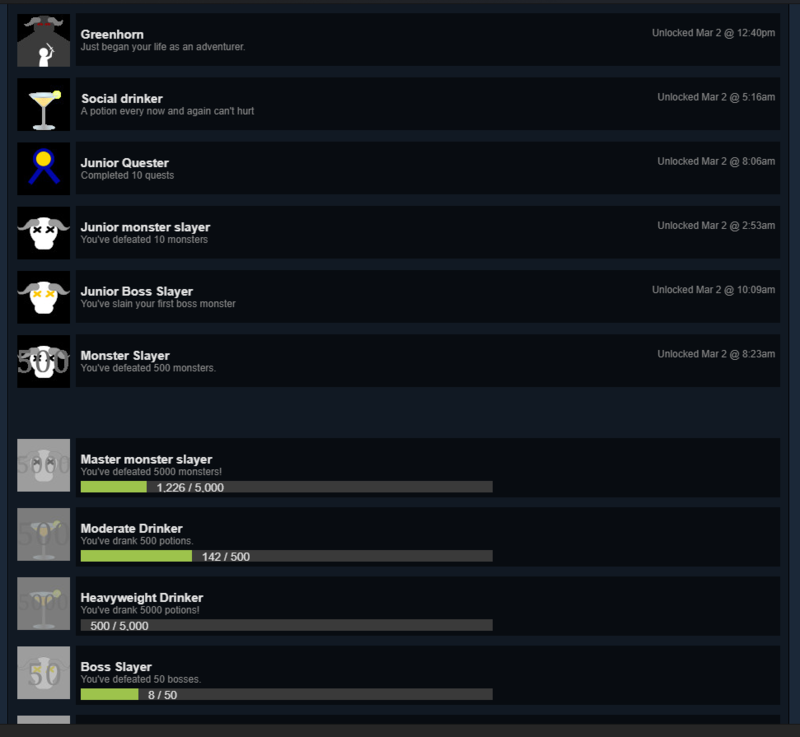 Next week I hope to start introducing steam achievements and maybe work on cloud saves a bit. I thank you all for reading and hope to see you here again next week. Until then, happy questing! Re: Quests Unlimited - Now available on the Steam Store! Lowered the scaled power of enemies. Slightly increased primary stats gained on level up for all classes. 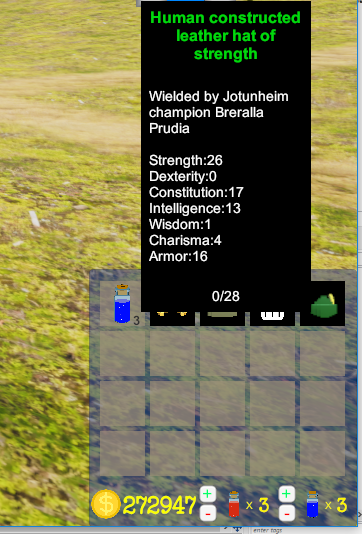 Added tooltips explaining stats and abilities. Greatly increased campfire regeneration rates. Cleric should no longer be able to cast heals while dead. Fixed a bug causing items in inventory not to load correctly. I'm not gonna lie, it was a bit of a frenzied effort to get those changes into the game to help get everything running smoothly. I'm glad it's done though because I think the game is a lot better as a result. Sadly this took up all my dev time this week and I didn't get to progress at all with steam achievements. I think that's OK though, improving gameplay satisfaction should be paramount in my mind. I think achievements and cloud saves are going o be backburnered for a little bit while I hammer out some quality of life changes that users have been asking for. So what's on this week's to-do list? More choice when creating parties is something I'm hearing about a whole lot. People want to be able to choose their party's composition as well as name their new companions. Honestly, part of me wants to hold on to the random assignment currently in place, but I also realize that it's pretty tedious to keep restarting the game and hoping you get something good, especially with load times. So I'll be working on a solution that hopefully satisfies all involved. Hopefully you'll hear all about it in next week's update. Hello everyone, I've been hard at work this week implementing a feature I've heard requested numerous times now. That's right, party names and classes are no longer completely random and are now customizable. When starting a new game, you'll now be loaded into a new scene allowing you setup your party before entering the gameworld for the first time. It should also provide a bit of information about the available classes for those new to the game. Old save files can not be customized. You can still load old save files without issues but you'll have to start a new game if you'd like to progress with your customized party. There's a couple days left of the "Lunar Blessing" event, so I suggest you take advantage of that to help gear up your new teams. Introduced combat music to the game. Music will now fade between the the standard background music and another piece indicating your party is in combat. Patched previously but never indicated: I fixed the party idle bug and reintroduced wolves into the game. That about wraps it up for this week's changes. I hope you all come back next week to read about what's new. Next on the agenda: achievements. Happy weekend everybody! It's been a week so I'm back to give you all your much needed dose of information. This week I've finally manage to implement something I've been droning on about for a long time now so I'm happy to get right into things. First and foremost, Quests Unlimited now has functioning Steam achievements! Being this is my first game on steam, I've never worked with their API before but I'm so happy I was able to get this going finally. It's one of those things that just kept getting pushed back and felt like it was taking forever to get done. The stats and achievements in place are not as robust as some, but it covers the basics and can now quite easily be added onto. Other than that, this week was largely spent on bug fixes and tweaking things a bit. Fixed bug that caused party members to equip inferior equipment when loading saves. Fixed bug causing monsters to spawn at higher level than player party. Slightly incentivised the Charisma stat for all classes when choosing equipment. That about sums it up for this week. Hopefully my players are as excited about the new achievements as I am. Hopefully there'll have even more wonderful things to be excited about next week! Thank you all for reading and I'll see you guys next week. Hey all, I got done a little ahead of schedule this week so I figured I'd get my DevLog post out early as well. There's some changes in here people have been clamoring for so I'm happy to announce them. First off, you can now lock items you're wearing to ensure they aren't replaced automatically. You can also now click an item in your inventory to equip it to appropriate party members! This will automatically lock the newly equipped item so that it's not replaced. When you click an item that can be equipped in your inventory, a list of eligible party members is displayed and you can simply click the button for the member you wish to equip the new item. Simply click the red exit button if you've changed your mind about equipping the item. The rarity of an item is also now clearly observable! With grey being the most common and red being the most rare. The rarity is determined by how close to a perfect set of stats the item has for it's level. So based on stat preferences, a green or blue item can still be preferable for your character over a purple item for example. You may have also noticed a new "Reset" button above in the equipment upgrade window. This button reset any temporary changes you have made so you can start fresh without reopening the window. Oh, and there's also EXP bars now! Hopefully I haven't forgotten anything, but that should be all the new introductions this week. Like the changes made this week? Have a few suggestions of your own? Let me know your thoughts down below! That's all for this week's update, hope to see you all again next week! I forgot to mention in yesterday's update that the bug with odd names replacing the standard item names has been fixed. I'm quite excited to bring you this week's update because it's targeted at bringing the opportunity for more active gameplay in Quests Unlimited. But before we get there, let's start off with another related feature implemented in this update. You may notice in this picture that there are 2 new buttons located next to the inventory window. 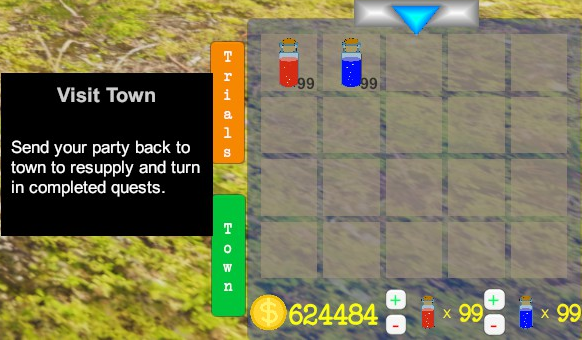 The Trials button I will get back to in a moment, but the green town button allows players the option to force their party to go back into town. While in town a party will turn in completed quests and do business with the merchant as usual. It's a great idea to restock on potions and clear out your inventory before attempting the "Trials". The Trials is a new challenge mode that pits your party against waves of enemies one after another. The waves steadily come in 10 second intervals and every 10th wave consists of 2 bosses for you to overcome. If successful, your party is given a breif respite to regroup by the campfire (and restock in town if needed) before returning for the next barrage of enemies. Oh, did I mention that your party will no longer automatically be using thier skills or using potions in this mode? That's right, this mode relies on the player to make those decisions and make the very most of their party's potential. 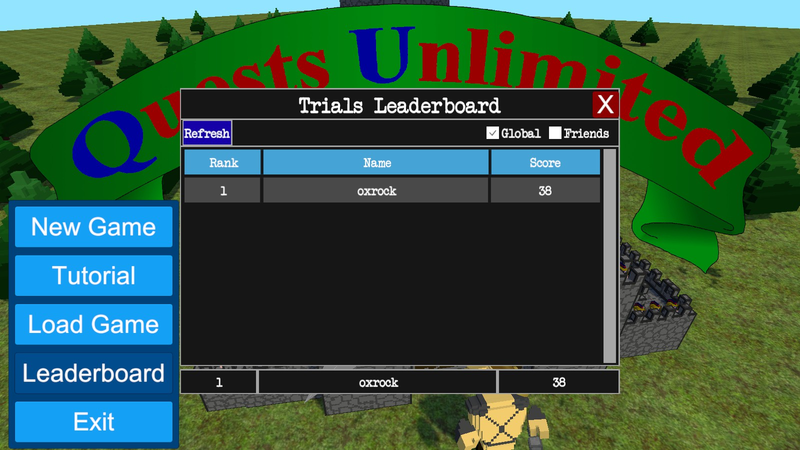 Your highest scores will be put on display for all to bare witness on our new Leaderboards! You can access the leaderboards from the titlescreen. I hope to see many more entries there soon, can anyone beat my score? The Trials are more challenging than you might expect, give it a try. New parties will no longer recieve 200 free gold when starting a new game.